Friday, January 25/Art Klub (1941 Arts Street): Sometimes you read a post, and everything else comes to a halt. Well, when we saw, “Zervigon Salon: Drag, Cocktails, and Key,” we stopped. Turns out, Art Klub is holding a salon — a gathering inspired by their host, Ben Zervigon — to not only amuse each another but to also refine the senses, and have a casual evening of drag expression, piano music, delicacies from their ancestors and of course cocktails passed down from Abolita. The extravaganza begins at 8:00 PM and goes until 11:00 PM. Donations for entry are requested ($20), and you can find out full details on the event here. ($40 Tickets) starting at 9:00 PM. For full details and tickets, you can check out their event page here. Saturday, January 26/Dillard University (2601 Gentilly Boulevard): Academics, scholars, and people hanging out waiting for a streetcar have all contemplated the question: What is justice? Now that question is being brought to the public through the What is Justice Symposium of Scholars. On Saturday the minds that inhabit the classrooms of Bard Early College in New Orleans and Dillard University invite you to join them in their discussions that range from “Transcending Incarceration Through the Arts” and “The Bill Cosby Case: Just or Unjust?” to “Environmental Racism.” This event is free and open to the public, it begins at 10:00 AM and goes until 3:00 PM, and you can find out full details here. Saturday, January 26/Southside Art Center (524 N. Foster Drive, Baton Rouge): We don’t often send people out of town for the weekend, but the event, “Pissy Sad Sad Nite,” might just warrant a car ride to Baton Rouge. This is an open mic event that allows poetry, comedy, music, performance art, being dumb, and being sad. (For real, we took that straight from their event explanation). In a world where everyone is telling us to “perk up” and “get happy,” this open mic is embracing the sad, so we embrace it. The evening of despondence begins at 8:00 PM and goes until 11:59 PM. For more details on this sad event, you can check out their event page here. Saturday, January 26/Marigny Opera House (725 Saint Ferdinand Street): Sometimes we make really bad (and by “bad” we mean “genius”) puns here at NolaVie. It’s time for another one. We want you to have a windsical (that’s the pun, not a misspelling) evening on Saturday by heading over to the Marigny Opera House. There will be wind music (get it now?) inviting innocence and imagination by the New Orleans Chamber Players. You will hear the workings of Jean Francaix, Divertissement for oboe, clarinet, and bassoon; Jonathan Dove, Figures in the Garden for woodwind octet; and Dvorak/Clements, Slavonic Dance No. 15 for woodwind octet. The doors open at 7:30 PM, there is a suggested donation of $20, and you can find out full details here. Saturday, January 26/Saturn Bar (3067 St. Claude Avenue): It’s time for some smooth recall to the 90s and early 00s. What we’re saying is: Shorty get down to all the smooth and dirty jams of the 90s and 00s. Cause we got you boo. If you not only miss that rhythmic lexicon, but also the jams of the 90s and 00s, Saturn Bar will be playing those tunes from 10:00 PM until 3:00 AM. There’s no cover charge, so you can get down with your bad self for absolutely nothing (except for the drinks you will need to hydrate!). For full information about this dance party, you can check out their event page here. 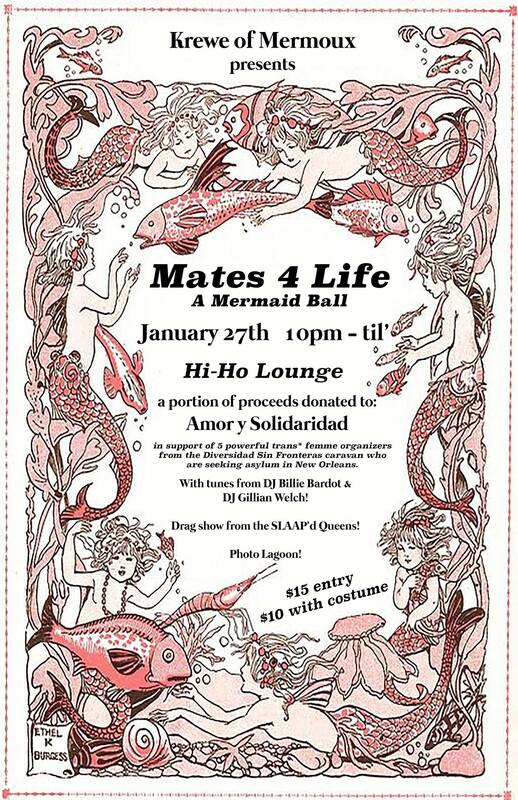 Sunday, January 27/Hi Ho Lounge (2239 St. Claude Avenue): Nothing quite says “Carnival Season” like going out on a school night, so embrace your carnival spirit (and energy) and head over to Hi Ho for the Krewe of Mermoux’s 3rd annual mermaid ball, Mates 4 Life. We all know the best ships are friendships so join the Krewe ot celebrate your pods, and your ability to dress in your sea best. There will be tunes from DJ Billie Bardot & DJ Gillian Welch, a drag show from the queens behind SLAAP’d & the Mermoux Krewe, and of course a photo lagoon and general underwater wonderland vibes. It begins at 10:00 PM, it’s $15 for entry entry, $10 with costume (think ocean love, nautical pairings, schools of fishiness, or basically anything that gives you mermaid & friendship feels). 25% of all proceeds benefit Amor Y Solidaridad, supporting 5 powerful trans femme organizers from the Diversidad Sin Fronteras caravan who are seeking asylum in New Orleans. For more information on the ball, check out their event page here.